Definition at line 15 of file CMathDependencyNode.h. Definition at line 14 of file CMathDependencyNode.cpp. Definition at line 22 of file CMathDependencyNode.cpp. Definition at line 30 of file CMathDependencyNode.cpp. Definition at line 48 of file CMathDependencyNode.cpp. Definition at line 38 of file CMathDependencyNode.cpp. Build the sequence of objects which need to be updated to calculate the object value. Definition at line 142 of file CMathDependencyNode.cpp. References CMathDependencyNodeIterator::After, CMathDependencyNodeIterator::Before, CMath::Dependent, CMathDependencyNodeIterator::End, getObject(), CCopasiObject::getObjectParent(), CMathObject::getSimulationType(), CMathObject::getValueType(), isChanged(), isRequested(), mChanged, mRequested, CMathDependencyNodeIterator::next(), CMathDependencyNodeIterator::Prerequisites, setChanged(), CMathDependencyNodeIterator::setProcessingModes(), CMathDependencyNodeIterator::skipChildren(), CMathDependencyNodeIterator::state(), CMath::UseMoieties, and CMath::Value. 167 // are skipped in Before processing. 175 // possible assignments depending on the context. Definition at line 53 of file CMathDependencyNode.cpp. Definition at line 33 of file CMathDependencyNode.cpp. Referenced by buildUpdateSequence(), updateDependentState(), and updatePrerequisiteState(). Definition at line 43 of file CMathDependencyNode.cpp. Definition at line 214 of file CMathDependencyNode.cpp. Referenced by buildUpdateSequence(), and updateDependentState(). Definition at line 224 of file CMathDependencyNode.cpp. Referenced by buildUpdateSequence(), and updatePrerequisiteState(). Definition at line 209 of file CMathDependencyNode.cpp. Definition at line 219 of file CMathDependencyNode.cpp. Definition at line 58 of file CMathDependencyNode.cpp. 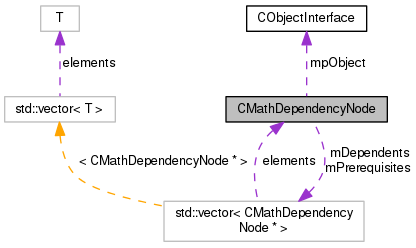 References CMathDependencyNodeIterator::Before, CMathDependencyNodeIterator::Dependents, CMathDependencyNodeIterator::End, getObject(), isChanged(), CObjectInterface::isPrerequisiteForContext(), CMathDependencyNodeIterator::next(), CMathDependencyNodeIterator::parent(), CMathDependencyNodeIterator::Recursive, setChanged(), CMathDependencyNodeIterator::setProcessingModes(), CMathDependencyNodeIterator::skipChildren(), and CMathDependencyNodeIterator::state(). 78 // The node itself is not modified. 85 // which is handled above. Update the state of all prerequisites (and prerequisites thereof) to requested. Definition at line 100 of file CMathDependencyNode.cpp. References CMathDependencyNodeIterator::Before, CMathDependencyNodeIterator::End, getObject(), CObjectInterface::isPrerequisiteForContext(), isRequested(), CMathDependencyNodeIterator::next(), CMathDependencyNodeIterator::parent(), CMathDependencyNodeIterator::Prerequisites, CMathDependencyNodeIterator::Recursive, CMathDependencyNodeIterator::setProcessingModes(), setRequested(), CMathDependencyNodeIterator::skipChildren(), and CMathDependencyNodeIterator::state(). 120 // The node itself is not modified. 127 // which is handled above. Definition at line 119 of file CMathDependencyNode.h. Referenced by buildUpdateSequence(), isChanged(), and setChanged(). Definition at line 118 of file CMathDependencyNode.h. Referenced by addDependent(), and getDependents(). Definition at line 116 of file CMathDependencyNode.h. Definition at line 117 of file CMathDependencyNode.h. Referenced by addPrerequisite(), and getPrerequisites(). Definition at line 120 of file CMathDependencyNode.h. Referenced by buildUpdateSequence(), isRequested(), and setRequested().